There’s a lot of talk these days about gluten. Products are advertised as “gluten-free,” and doctors advise certain patients to adhere to a gluten-free diet. But what exactly is gluten and why do some people need to stay away from it? Gluten is a protein found in wheat, rye, oats, barley and many processed foods. Some people suffer from a condition known as gluten intolerance. They feel sick after eating cereal, rice, pizza, cookies or pasta. They may experience bloating, gas, abdominal pain, depression and migraine headaches. 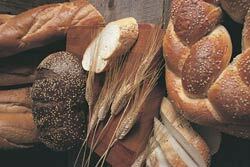 Gluten intolerance is also suspect in patients with asthma and autism. Although people may think grains are responsible for their discomfort, it may actually be the gluten that’s causing all the problems. For those who have celiac disease, an autoimmune disorder, gluten causes damage to the small intestine and affects the body’s ability to absorb certain nutrients. This causes vitamin deficiencies that can affect the brain, bones, liver and other organs. A correct diagnosis of celiac disease is especially important in young children who, because they are still growing, have age-based dietary needs. Stunted growth, malnutrition, diabetes, thyroid problems, osteoporosis and lymphoma are frequently associated with this disease. If you feel bloated after eating breads or grains, the culprit may be gluten. The only treatment for gluten intolerance and celiac disease is a gluten-free diet. You may need to work with a nutritionist to map out a diet that is gluten-free because gluten is a hidden ingredient in many processed foods, including salad dressings, processed meats, chocolate, licorice and flavored potato snacks. Gluten intolerance has also been linked to allergies, irritable bowel syndrome, weight gain, spontaneous abortions and multiple sclerosis. Proper nutrition (a gluten-free diet) and chiropractic care (to keep the nervous system in optimal condition) may help to reduce the symptoms associated with gluten intolerance and celiac disease.